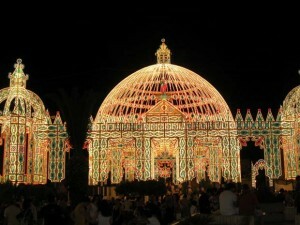 This hugely important festival celebrates Saint Domenica, the much-loved patron saint of the little town of Scorrano near Otranto in Salento. During the event, the whole area is illuminated by large three dimensional wooden structures and arches covered with lights, depicting everything from cathedrals to fantasy cities. They are made by talented local artisans and accompanied by music. Most people visiting this incredible event describe being left open-mouthed in amazement! There’s a great variety of food and drink to sample and the highlight of the celebration is a spectacular firework display. Not to be missed.